Many centuries before the Industrial Revolution in Europe, Muslims had already started on the path of innovation in the field of engineering and industrialization. There is ample evidence that suggests that Muslims were the first to make industrial uses of tidal power, wind power and steam power. As for wind power, the Muslims were using windmills in the 7''' century CE to grind com and to draw water for irrigation. It is reported that windmills were widely used during the rule of 'Umar ibn al-Khattab", the second Khaleefah. 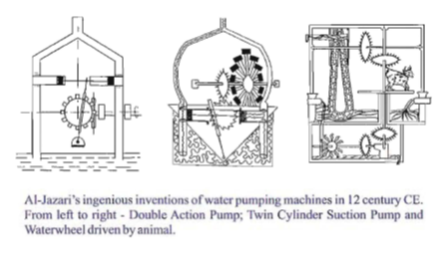 Building on the knowledge of the water flows, the Muslims invented water turbine, which had water wheels with curved blades onto which water flow was directed axially. This was first described in a 9th century CE Arabic text for use in a watermill. The Muslims are noted as the first to invent various types of industrial mills. These include, hullers ", paper mills , saw mills, ship mills, stamp mills, steel mills, sugar mills and tide mills. By 11th century CE, mills of all types were established across regions from Spain and North African to the Middle East and Asia. In additional to the mills, many other industries were established for astronomical instruments, ceramics, chemicals, distillation technologies, clocks, glass, matting, mosaics, pulp and paper, perfumery, petroleum, pharmaceuticals, rope-making, shipping, shipbuilding, silk, textiles, weapons, and the mining of minerals such as sulfur, ammonia, lead and iron. The first large factory complexes were built for many of these industries. Knowledge of these industries was later transmitted to medieval Europe. The Muslims' contributed greatly towards mechanical engineering as well. They worked on the mechanics of wheel, usage of axle, waterwheel, lever pulley, gears, toothed wheel, and other mechanical devices such as crank shaft. Amongst the famous mechanical engineers of the 13th century CE was Abu al-'Isa Ismail ibn Razzaz Badi al-Zaman al-Jazari. He wrote amply on various mechanical engineering topics and invented a number of machines. His best work was published in 1206CE title AI-Jami bain al amwal-Amal al-Nafi fi Sinat 'at al-Hiyal (The Book of Knowledge of Ingenious Mechanical Devices), in which he described in great detail 50 mechanical devices. Amongst his work include water clocks, hand washing device (for making ablution), machines for raising water, double acting pumps with suction pipes, use of a crank shaft in a machine, calibration of orifices, lamination of timber to reduce warping, static balancing of wheels, use of paper models to establish a design and casting of metals in closed mould boxes with green sand. Qaisar ibn Abu al-Qasim, a mathematician and astronomer (d. 1251 CE) made improvements on the waterwheels. 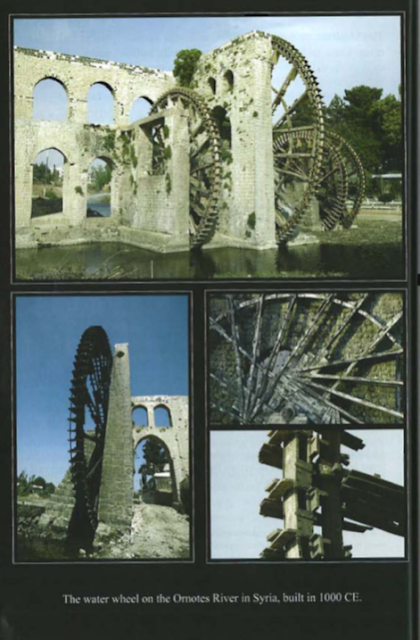 Such improved types of water-wheels are still seen on Orontes10 and are among the landmarks of Hama. Muslims led the world at that time in making clocks. Muhammad ibn 'Ali ibn Rustam al-Khurasani was a famous constructor of clocks, and as a result, he was called al-Sa 'ati (the clock maker). 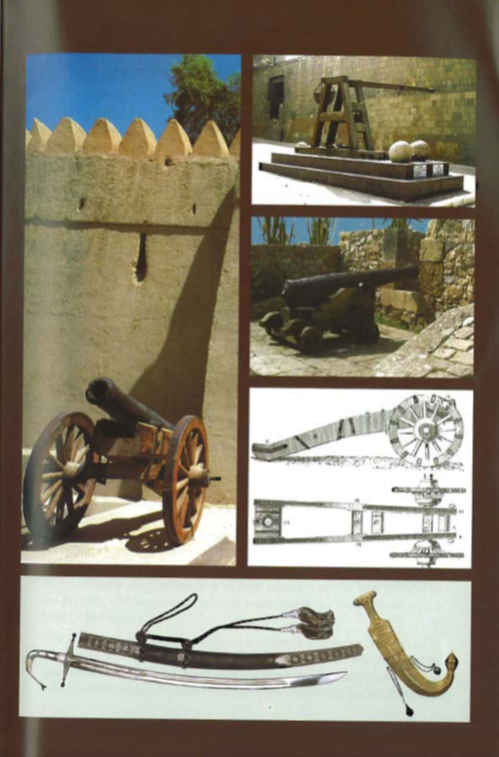 The Muslims were also the first to use explosive material in guns and cannons. The purpose of this invention was to throw bullets at the enemy from a long distance. The Chinese used sodium nitrate only. But the penetrating power of explosives was discovered and used only by the Muslims. The earliest known military applications of these explosive gunpowder compositions were the explosive cannons first used by the Muslims to repel the Mongols at the Battle of Ain Jalut in 1260 CEo The statement given by Ibn Khaldun in his History of Berbers also proves the use of the guns at the time of war.